There was once a young girl named Mary. Mary was good and kind. Her face was sweet and beautiful and her voice was soft and gentle. Everyone who knew Mary loved her. That was because Mary loved them. But most of all Mary loved the heavenly Father. She tried each day to do the things that would please him. One day Mary was all alone. She was thinking of the heavenly Father. She felt very thankful for his love and care. She bowed her head and whispered a little prayer. And then as she opened her eyes she saw that the place was filled with a strange light. Mary looked and there standing before her she saw an angel. At first Mary was afraid. What could it mean? What a wonderful secret it was that the angel told Mary! Mary was almost too surprised and too happy to speak. 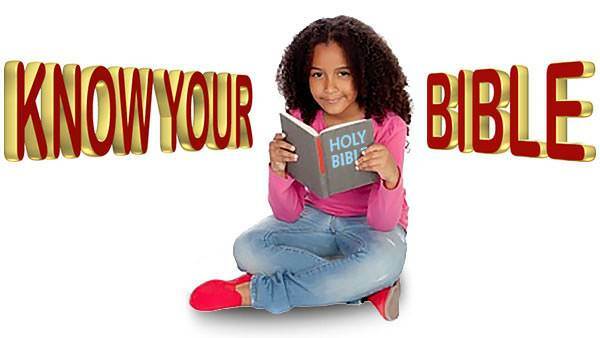 “Be it unto me as God wills,” she said quietly. And then the angel went away. But Mary kept thinking of her wonderful secret. She kept thinking of the wonderful baby who was someday coming to be her own little boy. She remembered that the angel had said he would be God’s own Son. It made Mary happy just to think about it. One day Mary and her husband Joseph had to go on a journey. They had to go to another town called Bethlehem. It was a long, long way. Mary rode on a donkey. 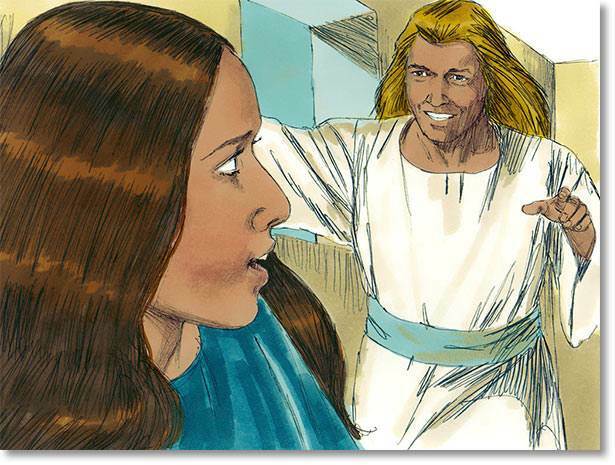 Joseph walked beside her, leading the way. On and on they went all morning. The road was filled with travelers. They were all going to Bethlehem. Some went faster than Mary and Joseph and the little donkey. On and on they went all afternoon. Mary grew very tired. It was almost night when they reached Bethlehem. 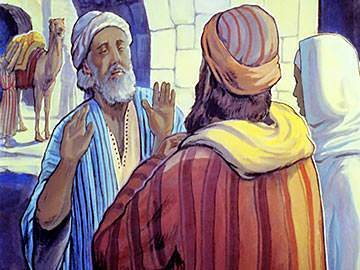 “We must find a place to stay overnight,” said Joseph. Joseph looked worried. 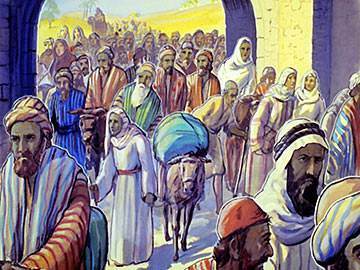 There were so many people who had come to Bethlehem. Joseph was afraid it would be hard to find a place to stay. And Mary was so tired. 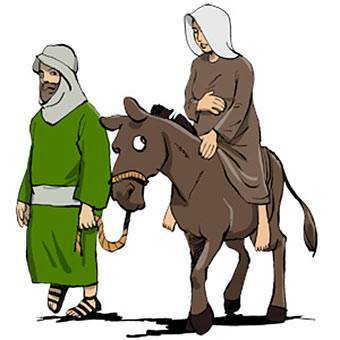 Joseph led the little donkey to the inn where travelers stayed. How crowded it was! “Can you let us have a room where we can stay tonight?” he asked the innkeeper. 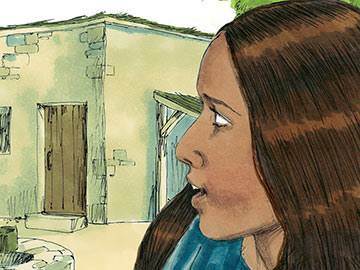 So Joseph took Mary to the stable. He made her a soft bed in the hay and she lay down to rest. Soon all was still. And then, in the night, a wonderful thing happened. The secret the angel told came true. God sent Mary a little baby boy. Mary had no crib for a bed, so she made a little bed in the soft hay. “His name is Jesus,” she whispered softly. 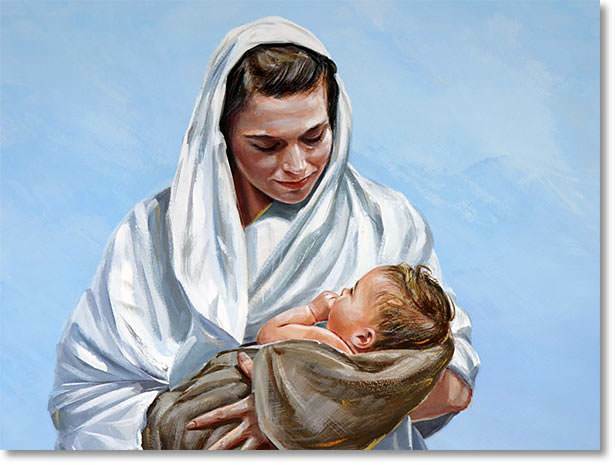 Mary was very happy as she held the baby Jesus in her arms. 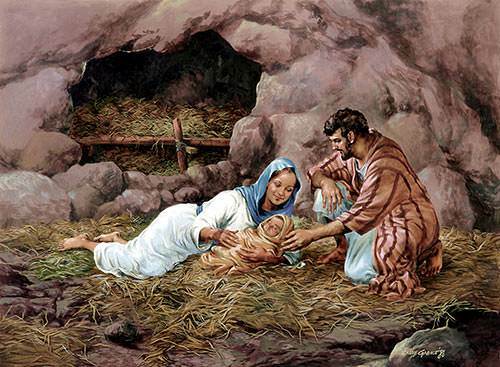 She knew he was God’s best gift to the world.